Ramsgate passenger and car ferry ticket prices, timetables, ticket reservations and information for ferries sailing from Ramsgate to Ostend. Compare all available Ramsgate ferry ticket prices in real time and book the cheapest available Ramsgate car and passenger ferry tickets sailing to and from Ramsgate, Ostend with Trans Europa Ferry ferries online with instant confirmation. Book Ramsgate Ferry Tickets with TransEuropa Ferry for ferries sailing from Ramsgate to Ostend online in advance to enjoy the cheapest available ferry ticket price. The price you see is the price you pay. There are no hidden extras or surprises such as added fuel surcharges or booking fees and we do not charge you anything extra for paying with a Visa Electron card. The price we quote you for your selected Ramsgate passenger or car ferry ticket, onboard accommodation and vehicle type is all you will pay, and that's a promise. To obtain a Ramsgate ferry ticket price and book your ferry ticket securely online please use the real time ferry booking form on the left. You are also able to add a hotel at your destination, or anywhere else, to your ferry ticket when completing your ferry ticket reservation. 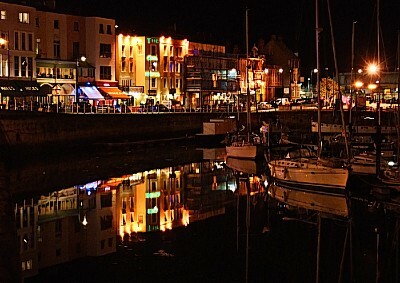 Ramsgate is a South-facing Seaside resort and is proud of its status as England's only Royal Harbour and was the main embarkation point for ships to both the Napoleonic Wars and Dunkirk in 1940. Ramsgate also boasts its very own Meridian Line. Five minutes and 41 seconds ahead of GMT! You'll find it in the Maritime Museum, along with artefacts evoking the town's rich heritage of fishing, shipbuilding and shipwrecks. Ramsgate's compelling past includes landings by Anglo-Saxons, Romans and Saints & fine architecture peppers the town with elegant Georgian terraces and impressive Regency villas, with more than 900 listed buildings. Augustus Pugin best known for his work on the Houses of Parliament, lived here and he designed many local houses to showcase his talents. Ramsgate was a small fishing and farming community until 1749 when the harbour was built. Now Ramsgate’s large marina attracts many summer visitors. Along the sea front are a good supply of ice cream parlours, beach shops and traditional fish and chip shops making it a typical English seaside resort. Cross-channel ferry services were operated by TransEuropa Ferries, sailing to Ostend in Belgium who unfortunately went into Administration in 2013. Unfortunately, since then there has not been a regular ferry service specifically dedicated to cross-channel day-trippers. However, in August 2014 Thanet Council advised that talks are under-way with potential ferry operators for Ramsgate port. In the meantime there is the Port of Dover which is less than 20 miles away, which has the capacity for regular passenger services to Calais in France. On Fridays and Saturdays there is a local market which is a great place to trawl for bargains. Each August Bank Holiday, the Summer Squall multi-arts festival serves up a feast of workshops, exhibitions, film, theatre and dance. While in July, Thanet at War brings the 1940s vividly to life. The sheltered sandy beach is popular with young families and the cliff tops offer excellent opportunities for cliff top walking with great sea views. The modern marina has a scenic waterfront lined with cafés and pubs with outdoor tables and a real cosmopolitan vibe. The port itself provides opportunities for sea fishing, sailing, water sports and even day trips across to Ostend in Belgium. More locally it’s easy for visitors to hop on a boat trip to spot seals on the Goodwin Sands, discover gorgeous beaches and bays, or view the Thanet Offshore Windfarm's 100 turbines. The scenic waterfront is lined with cafés and pubs with outdoor tables. The former RAF Manston site now houses the RAF Manston History Museum, the Spitfire and Hurricane Memorial Museum and the Manston Fire Museum, which all make an interesting day out. For golfers there are some championship golf courses around Sandwich and Deal, both less than ten miles from Ramsgate. A little further afield, the Kent coastline is dotted with many historic castles such as Dover Castle, Deal Castle and Hever Castle, the former home of Anne Boleyn. Best Price Guarantee - We always offer you our lowest available DFDS Seaways, Stena Line or P&O passenger and car ferries ticket price to and from Caen. There are no hidden extras or surprises such as added fuel surcharges or booking fees and we also we do not charge you anything extra for paying with a Visa Electron card. The price we quote for your selected Caen ferry ticket, onboard accommodation and vehicle type is all you will pay, and that's a promise! In the unlikely event you find the same all inclusive Caen ferry ticket cheaper in the brochure of any other tour operator we promise that we will do our best to beat that price or offer you the choice of requesting a refund. To book Caen car and passenger ferry tickets please click here. At FerryTO you are able to obtain live Caen ferry ticket prices, check availability and book car and passenger ferry tickets to and from Caen at our lowest available ticket price. Ferryto.co.uk is part of the world's largest online ferry ticket distribution network providing the ability to book over 80 major European ferry operators including to Caen and to over 1,200 other ferry routes throughout the UK, France, Spain, Ireland, Holland, Eastern Europe, the Mediterranean, the Baltic and North Africa.